You are here: Home / competitions / Win Tickets to Get Diverted Four Years On The Terrace Celebration! 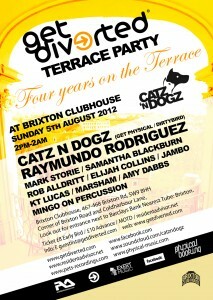 It’s been 4 years since Get Diverted first took over the terrace at Brixton Clubhouse and it’s thanks to you all that they have created a unique Ibiza like haven in the heart of Brixton. For this huge celebration they have none other than the Polish duo Catz N Dogz, bringing deep house and tech house vibes to the terrace. Their busy summer schedule finds them in Ibiza, Berlin, Canada and now Brixton Clubhouse for the party of the summer! The duo have their own label called ‘Channels Records’ and their last album ‘Escape from the Zoo’ was a jungle of genres including collaborations with heavy hitters dOP, Claude VonStroke and Jazzanova’s vocalist Paul Randolph. Alongside them are residents Raymundo Rodriguez and Samantha Blackburn along with guests Elijah Collins and Jambo to name a few! Plain and Simple want to say a huge well done to the Get Diverted team for continuing to deliver great summer time vibes on the terrace, and as such we’ve teamed up with them to offer a pair 5 pairs of tickets to the 4th Birthday special! – Yes thats 5 lots to be won! What country to guests Catz N Dogz hail from? Don’t forget to include all your contact info! Closing date for entries is the 1st August.